Today we got to see the baby for the first time. We got to see it wiggling around, and we got to see the sweetest flashes of light. Flicker flicker flicker. Because ultrasounds always look like a sea of static to me, the sickle/fish/bean looking squiggle on the left is the (gulp) future baby. The cheerio looking thing on the right is the yolk sac, which provides nutrients to the (gulp) future baby until the placenta takes over. 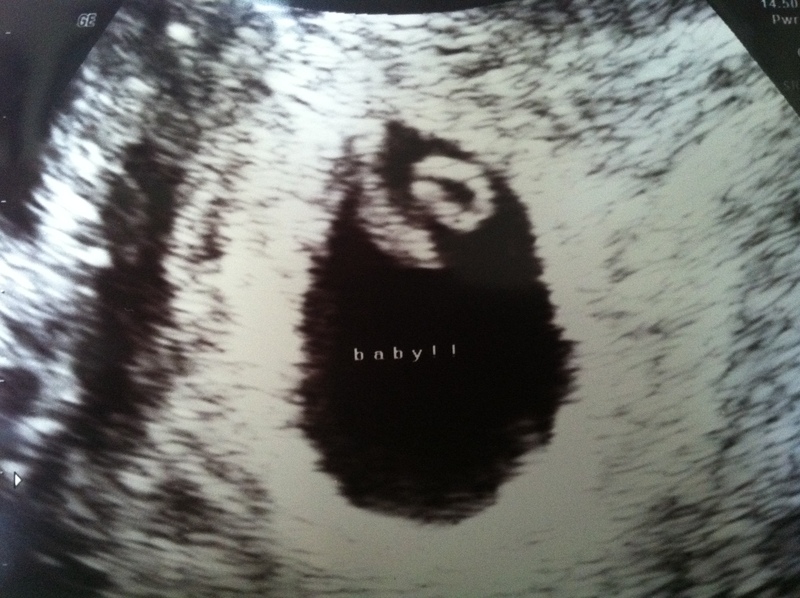 Having seen the heartbeat at 6 weeks, 5 days, the doctor told me my chance of miscarriage is now 5%. I can live with 5% much better than the odds I was previously living with. We get one more scan in 10 days with my beloved RE. Then we’re cut loose into the wilds of OB land, with all those pregnant women, blithely confident in their body, and sure that in 6 or 7 months time they’ll meet their (gulp) baby. I’m so…I don’t know what. I feel a lot more confident now that we’ve seen that there’s a something in there, and that something has a heartbeat. I’ve been getting progressively sicker, and threw up for the first time yesterday, so that also encourages my faith that this might…actually…work out. And yet there’s this other part of me that is waiting for the other shoe to drop. I’ve spent over a year preparing myself for bad news over and over and over, and changing my mindset to not always assume the worst is still very much a work in progress. Overall I’m overjoyed that we’ve made it this far. I’m cautiously optimistic that A Good Thing might come out of this, and I’ve devoted significant energy to sending out thoughts/prayers/vibes to the universe at large, saying nothing more than “please” and “thank you”. I hope all of you get your “thank you” soon. This entry was posted in Pregnancy and tagged Baby, Family, Lesbian Parenting, Pregnancy, Progesterone, Ultrasound, Yolk Sac by Sarah. Bookmark the permalink. Awesome!!! 5% sounds pretty good to me, or should I say, 95% sounds pretty good! Keeping my fingers crossed for you! Congrats again! Great first pic of the little one! For me, after a couple normal u/s I was finally reassured that things are doing what they’re supposed to be doing and even if I don’t look super pregnant or throw up all the time, no bad news is good news. Just wait until your next scan! That little bean will be like a gummy bear and we could see him waving his arms and legs!! I never stopped checking the tp, as it were (only a metaphor for me, since I doubt I’ve failed to check the tp more than a dozen times since turning nine, the age I’d set for fretting that my period would come and surprise me). It’s a momentous time, and I am just not wired to be free of anxiety. But I found it was increasingly possible to temper my worries with some enjoyment of the present, too. Congratulations on your lovely bean. Isn’t it funny how all the others are just blobs on a screen, and yours is magic? What a miracle. This is brilliant! I’m so happy for you! I’m glad it’s at least a little reassuring to have seen the heart beat. I’m sure as the weeks pass you’ll start feeling less and less fearful and more and more excitement. I’m so happy for you, congrats!!! Huge dork right here! Crying happy tears for you! I am so happy for you and Tammy. Hurray for a heartbeat, and all of the static that means something is happening! Yay for that little flicker! And for 95% odds! Sounds like a wonderful scan to get to see a heartbeat! And those odds sound so much better. So glad for you and Tammy that things are progressing!